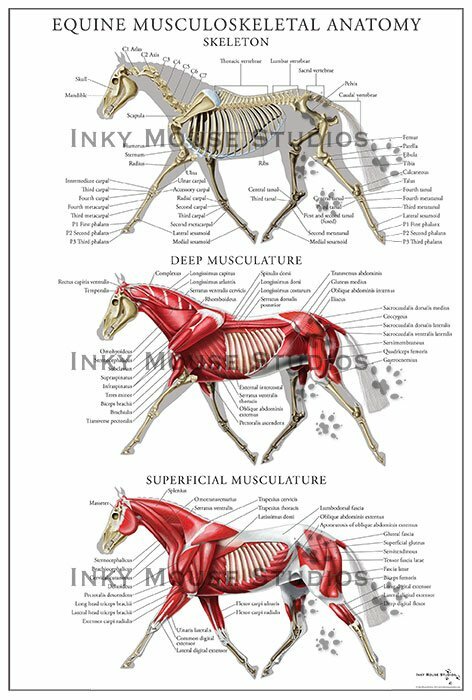 This high resolution anatomical poster features all three major groupings of the equine musculoskeletal system – the complete skeletal system, the deep musculature system and the superficial musculature system, in one poster. All three systems correlate with each other to help the viewer understand visually how all three of the different groups relate to each other depending on the depth of view. This high resolution, full color commercial quality poster is printed on durable 12 mil PVC and suitable for hanging in a classroom or clinical setting.